RESIDENT EVIL: THE FINAL CHAPTER, the sixth and final installment in the worldwide franchise phenomenon, premieres first on UK Digital Download May 29 and 4K Ultra HD, Blu-ray 3D, Blu-ray and DVD June 12 from Sony Pictures Home Entertainment. 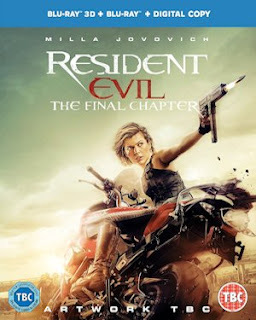 Milla Jovovich (Resident Evil franchise) is back as the iconic zombie slayer Alice, who is forced to return to The Hive, where her story began. The Umbrella Corporation is gathering its undead forces for a final strike against the survivors of the apocalypse and Alice must prevent complete human extinction before it’s too late. Returning with Jovovich are franchise regulars Ali Larter (Final Destination), Shawn Roberts (Resident Evil: Retribution) and Iain Glen (“Game of Thrones”), alongside all-new cast members Ruby Rose (“Orange is the New Black”), Eoin Macken (“The Night Shift”) and William Levy (The Single Moms Club). Written and Directed by Paul W.S. Anderson, RESIDENT EVIL: THE FINAL CHAPTER is produced by Jeremy Bolt, Paul W.S. Anderson, Robert Kulzer and Samuel Hadida; with Martin Moszkowicz and Victor Hadida serving as executive producers. Arrow Video releases, this August.